The Internet is littered with land mines of bad bracket advice. Are you hell-bent on picking a 12-seed to upset a 5-seed just because every analyst is telling you to? Keep in mind that the 5s have emerged victorious about two-thirds of the time over the past 35 years,1 but more important, remember that keying in on the right 12-seed won’t win you the big bucks. Standard pools award a sole point for Round of 64 selections, meaning the real edge comes with choosing the proper champion and earning the 32 associated points. And that’s what makes this year’s bracket such a challenge. Whether you’re getting advanced analytical advice from KenPom, FiveThirtyEight, or my site, The Power Rank, you’re seeing the same thing: undefeated Kentucky listed as a colossal favorite to cut down the nets in Indianapolis on April 6. Picking the proper champion is often enough to win a pool, but it might not be this year, when the bulk of your fellow entrants will also be hitching their wagons to the Wildcats. Your coworker’s grandma might not know the difference between John Calipari and Nick Saban, but if she picks Kentucky because the numbers tell her to and then gets lucky with a few early picks, she could win the whole damn thing. Going strictly by the rankings might sustain you in a 10-person pool, but the chances of winning decrease as the number of people in the contest increase. Instead of fighting upstream along with everyone else who’s been hypnotized by Karl-Anthony Towns, consider a different approach: selecting a possible champion that’s been overlooked compared with Kentucky, but is still an analytics darling. Consider picking the other Wildcats: Arizona. Arizona, a 2-seed, has largely flown under the radar, due to both Zona’s early season struggles and Kentucky’s relative unrivaled excellence. However, the Pac-12 champs are second in my rankings, and my win probability odds give them an 11.2 percent chance of winning the tournament. The early ESPN results, though, indicate that only 6.1 percent of the masses are picking Arizona, making Sean Miller’s crew a smart contrarian choice. To explain how picking the contrarian champion increases your odds of winning a pool, I’ve developed a simulation method for the tournament based on my win probabilities. This simulation allows me to calculate how often a given bracket will win a pool filled with randomly selected brackets submitted to ESPN’s bracket challenge. Let’s look at the 2010 tournament, in which Kansas was the prohibitive favorite, boasting a 31 percent win probability according to my metrics. According to ESPN, 42 percent of submitted brackets listed the Jayhawks as the champion that year. Duke, meanwhile, boasted a 21 percent win probability, but earned the support of just 7 percent of ESPN contestants after underachieving during the regular season. In a pool featuring fewer than 10 people, picking the higher-ranked team in each game until Kansas emerged as the champion would have given you the best chance to win. In a pool with more than 10 people, however, the contrarian strategy would have led you to sub in second-ranked Duke as the champion. 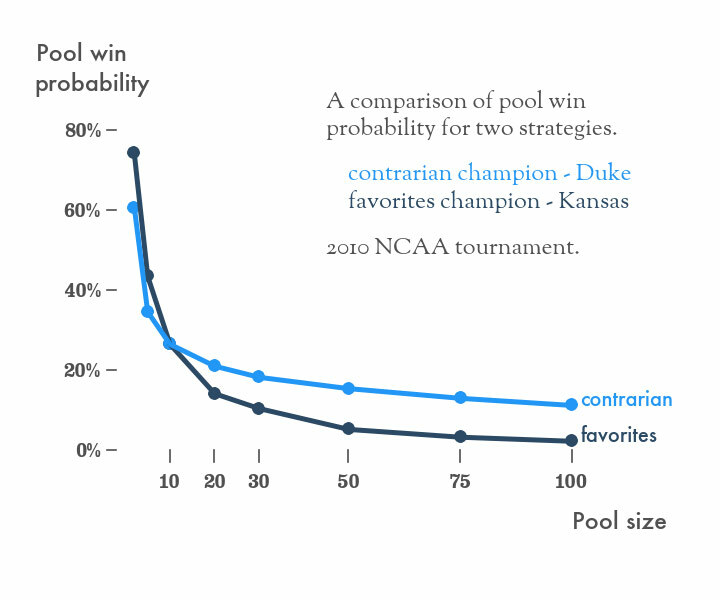 For a medium-size, 50-person pool, choosing Kansas as champion would have given you a 5.1 percent win probability; choosing Duke would have given you a 15.3 percent chance, three times as high as picking the prohibitive favorite. Duke won the tournament in 2010, providing contrarian strategists with an excellent chance of winning medium-size pools. The same logic applies to Arizona and Kentucky this year. Arizona has many desirable traits in 2015, including size in the frontcourt, one of this year’s top draft prospects in freshman phenom Stanley Johnson, and the win probability to support the contrarian strategy. The Wildcats have a difficult road to the Final Four, sharing the West Region with strong teams like 1-seed Wisconsin, 3-seed Baylor, and 4-seed North Carolina. Still, as the second-best team in my rankings, Arizona has an 11.2 percent chance to win the tournament, making these Wildcats this year’s contrarian champion and your best chance to win a medium-size pool. Ed Feng (@thepowerrank) has a PhD in chemical engineering from Stanford, runs the sports analytics website ThePowerRank.com, and just completed his first e-book, How to Win Your NCAA Tournament Pool. If you insist: The analytics like Buffalo over West Virginia best this year.